Thank you for your support! With your help we were able to raise $1,424.58 for the Humane Society of Southwest Missouri. Stay tuned for future collaborations with local charity organizations. The mission of the Humane Society of Southwest Missouri is to aid in the alleviation of distress and suffering of animals by operating a shelter for animals in need of care, placing animals in suitable homes, and offering educational programs that promote animal welfare. The shelter became a No-Kill in 2016. The shelter puts an average of 4,000 animals a year into new homes. They are locally funded and 100% supported by the community for funding. 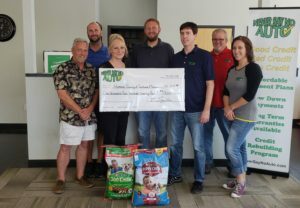 The Humane Society of Southwest Missouri is an independent, 501(c)3 non-profit organization licensed by the Missouri Department of Agriculture. They operate the only open-admission humane society in Southwest Missouri. No limits are placed on the number or type of dogs or cats accepted at their shelter. Funding for the organization comes 100% from private donations, so come see us and help support the Humane Society of Southwest Missouri! 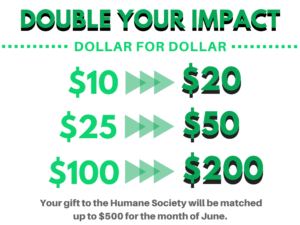 *Donations will be matched up to the first $500.